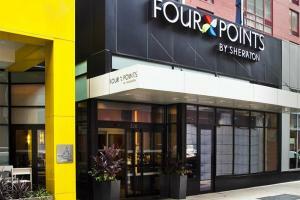 Four Points by Sheraton Midtown-Times Square is conveniently located in the heart of Manhattan. This Times Square hotel is just steps from exquisite restaurants, eclectic shops, and well-known museums. The hotel’s sleek design, casual comfort, and great service will suit the needs of leisure travelers. Located in the heart of New York City, just steps from Times Square and many major subway lines. Gotham Bistro - Popular cuisines from around the world, anchored by classic Irish favorites; Rooftop Bar. Central Park, Bronx Zoo, Museum of Modern Art, Empire State Building, Top of the Rock Observation Deck at Rockefeller Center, Times Square, 5th Avenue, Carnegie Hall, Madison Square Garden.